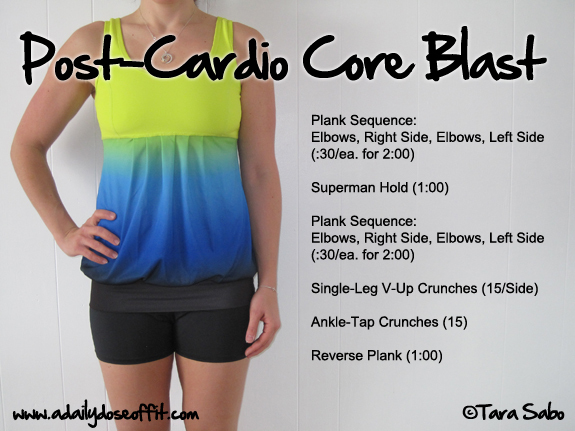 You probably already know that your core gets a workout whenever you snag some cardiovascular exercise. If you didn't know this, then you should know that it's because your core is what keeps you upright. Balanced. On your very own two laced-up feet. But even when you're sitting and sweating, your core is still engaged because there's most likely a seat of sorts you need to keep yourself in. Nowhere is this more evident than in a cycling situation. But here's the thing: Your core needs a little more than a hard-core sweat session on the bike, treadmill or elliptical. Which is why I love sliding in some core exercises post-cardio. It's not much, but a good core blast is quick, efficient and engaging.Move through each element of the plank without dropping to your knees or stopping the clock. And for the reverse plank, remember to plant your hands directly beneath your shoulders with your fingers pointing toward your feed. Any questions? dailydose (dot) notes (at) gmail (dot) com. Speaking of "post" cardio, if you're looking for something delicious and healthy to snack on, you might want to consider a Pomegranate Blueberry Pistachio KIND Bar. They're new to me, but perhaps not so new to you. Either way, I'm telling you—they're good. Question: What's your favorite core exercise...besides the plank? I used to like Turkish Get-ups, but now I like Renegade Rows. And by like I mean hate, since they point out where I'm weak.